The Kansas high school football season is officially underway and the Kpreps Friday First Look provides our initial reaction to some most notable games and performances in the state each week. It was an exciting opening week that resulted in nine schools end their double-digit losing streaks. Let’s take a look at those and some of the other more notable results from Week 1. Wichita Northwest sophomore Carson Arndt split the uprights on a 20-yard field goal with two seconds remaining to propel the top-ranked Grizzlies to a 23-22 victory over defending Class 5A champion Bishop Carroll. With Northwest trailing 22-14, senior running back Breece Hall escaped from midfield for a long touchdown run early in the fourth quarter. But Carroll stopped the Grizzly two-point attempt leaving the score at 22-20, and setting up Arndt’s late-game heroics. Carroll got on the board first as Dalton Nichols returned the game’s opening kickoff for a touchdown, but a blocked PAT kept the lead 6-0. Northwest quarterback Reagan Jones broke free for a 24-yard touchdown run and a 7-6 lead. Carroll would answer with a field goal to lead 9-7, and expand their lead on a touchdown pass from Cade Becker to tight end Clay Cundiff. Jones would add his second touchdown run to pull the Grizzlies within 16-14 at the half. Becker connected with Mason Baalman on a touchdown pass late in the third quarter, but again the PAT was blocked and Carroll’s lead was 22-14. The game came down to the final play for the second consecutive season. Last season, Carroll scored in with 14 seconds remaining to top Northwest, 40-35. Class 5A’s second-ranked St. Thomas Aquinas Saints grinded out a 30-14 victory over the No. 3 ranked team in Class 6A, Blue Valley. In a game that went back-and-forth in the first half, Aquinas went into intermission with a 21-14 lead. The Saints then shut out the Tigers 9-0 in the second half, thanks to a consistent running game and a stifling defense. Aquinas rushed for 415 yards, including 256 yards and two scores from sophomore Tank Young. Pittsburg used a stifling defense to set the tone in a 43-8 victory over Labette County. The game, featuring the Nos. 4 and 5 teams in Class 4A, was voted as the Game of the Week by Kpreps fans. The Purple Dragon defense continuously pressured Labette County quarterback Eason Dean and shut down the Grizzly offense. Labette County’s lone score came on a kickoff return by Caleb Hentzen late in the third quarter. After forcing an early three-and-out, Pittsburg needed just one play to get on the scoreboard. Senior back Brandis Evans went untouched for 46 yards and a score to give the Dragons a 7-0 lead. Quarterback Ty Roark’s 33-yard touchdown run later put Pittsburg up two scores. 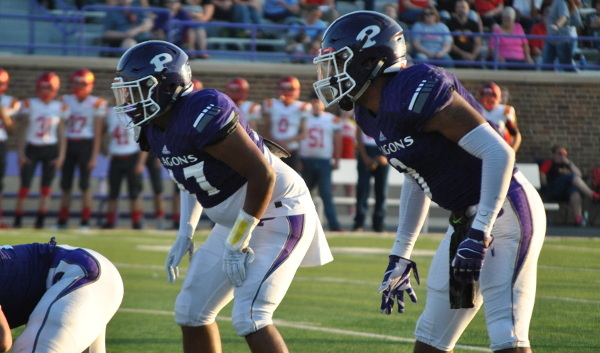 At halftime, the Purple Dragon defense had held Labette County to 35 yards of total offense and enjoyed a 30-0 lead. Victoria won the key Central Prairie League battle over Otis-Bison, 28-14 on Friday night. Cooper Windholz rushed for two touchdowns and passed for another to help the Knights to a 22-0 lead. Otis-Bison got on the board before halftime on a long touchdown run by quarterback Anton Foust to pull within 22-6. Foust didn’t play in the second half, but Seth Hoopingarner led the Cougars on a touchdown drive to pull within 22-14. Victoria regained a two-score lead on a touchdown run by Tyler Knoles. The Knights then intercepted Otis-Bison three times in the fourth quarter. Defending Class 3A champion Sabetha controlled Friday’s game against Nemaha Central in winning, 33-7. The Bluejays scored twice in each of the first two quarters to take a commanding 26-0 lead into halftime. Gabe Garber rushed for two touchdowns and Mason Engelken and Joe Gruber each added a scoring run as the Bluejays churned out 395 yards rushing on the night. Engelken led Sabetha with 131 yards on the ground, while Garber added 112. The win snaps Nemaha Central’s 9-game regular-season win streak in this series. Sabetha previously did defeat the Thunder in the 2014 playoffs. For a second consecutive season, Pratt went in to Hoisington and came away with a victory. Travis Theis rushed for 204 yards and four touchdowns to lead the Greenbacks to victory. Theis scored Pratt’s first four touchdowns of the game to give the Greenbacks a 27-0 lead. Pratt’s victory at Hoisington last season ended the Cardinals 21-game home win streak. Rossville scored two fourth-quarter touchdowns to pull out a 26-14 road victory over Centralia. Garrett Carver led the Bulldawgs with three rushing touchdowns and 195 yards on the ground. Centralia, which entered the season ranked No. 2 in Class 1A, was led by junior Kamble Haverkamp’s two rushing touchdowns. Gardner-Edgerton began the Ryan Cornelsen era and the transition to the Sunflower League with a 28-23 upset of Class 6A No. 5 Shawnee Mission East. In doing so, the Blazers snapped a 10-game losing streak that dated back to the 2016 season. Shawnee Mission East led 16-14 in the fourth quarter until Gardner-Edgerton quarterback Teven McKelvey gave the Blazers the lead for good with a touchdown run. On the next series, Teven Ewbank picked off a Lancer pass and returned it for a touchdown and a 28-16 Blazer lead. Shawnee Mission East would score with under two minutes remaining, but could not get the onside kick. Gardner-Edgerton has given Shawnee Mission East trouble in each of the past two seasons in the playoffs. The Lancers defeated the Blazers 36-35 back in 2016, and 42-28 last season. Wichita West blasted Hutchinson 55-14 in a game played at Friends University. The Pioneers scored twice in the final minute of the first half to turn a 14-14 tie into a 28-14 halftime lead. The second half was all West as the Pioneers scored three times in the third quarter to pull away. West quarterback Zion Parks rushed for four touchdowns in the victory. Washburn Rural scored on a 13-yard touchdown pass from Jordan White to Jaylen Carter with under 90 seconds remaining and survived a final Emporia drive to pull out a 28-24 road win. Emporia drove inside the Washburn Rural 10-yard line late in the game, but could not connect on four consecutive pass attempts into the end zone. After missing much of last season due to injury, White returned to guide the Rural offense and rushed for two touchdowns while passing for two more scores. White finished with 137 yards passing and 93 yards on the ground. Emporia was led by Gabe Galindo’s 153 yards rushing. Wellington defeated Wichita Collegiate for the first time in school history on Friday night, and did so in dominating fashion. The Crusader defense held Collegiate to 90 yards of total offense in the 32-0 shutout. Michael Ledbetter passed for 217 yards and two touchdowns only six completions. Ledbetter connected with De’Andre Washington on two touchdown passes over 80 yards. Elkhart held off Cimarron 27-20 in a game that was delayed several hours by lightening and eventually called with 11:30 remaining in the fourth quarter. Osborne, ranked No. 2 in 8M-II, outscored Hill City in what would be a high scoring game on the basketball court. The Bulldogs won 88-76 after leading 40-26 at halftime. Senior quarterback Darnell Holloway rushed for 356 yards and seven touchdowns and also passed for 94 yards and another score. Kade Miller added 153 rushing yards and three touchdowns, and 91 receiving yards and another touchdown for the Bulldogs. Garden Plain scored with less than a minute to go to top Central Plains League rival Cheney, 15-12. John Nowak’s 1-yard touchdown run and two-point conversion gave the Owls the lead. Garden Plain’s defense then came up with an interception in the final seconds. Garden Plain outgained the Cardinals 237-185. The Owls kept the ball on the ground with 175 yards rushing, led by Nowak’s 58 yards. Each team turned the ball over three times. Despite graduating eight starters on defense a season ago, McPherson used a dominating defensive effort on Friday to shut out Salina South, 21-0. The Bullpups stifled the South run game by holding the Cougars to 2 total rushing yards on 24 attempts. Jace Kinnamon led the McPherson offense with 134 yards rushing, while quarterback Kyler Hoppes passed for 169 yards. The McPherson defense held Salina South to 86 total yards and forced three turnovers. Sedgwick senior quarterback Hooper Schroeder had a game in the Cardinals’ season-opening win over Whitewater-Remington. Schroeder completed 31 of 51 pass attempts for 502 passing yards and two touchdowns in the 46-6 victory over the Broncos. The Cardinals amassed more than 650 yards of total offense against the Remington defense. Wide receiver Kale Schroeder caught six passes for 161 yards and a score, while Gavin Fitch added 118 yards on five catches. Southeast-Cherokee ended a 28-game skid with a 20-6 victory over Uniontown. Southeast, in its first season in the Three Rivers League, had not won since defeating Northeast-Arma 27-20 back on October 10, 2014. On Thursday night, Wichita North defeated Wichita South 29-22 to snap a 21-game losing streak. Prior to last night, the Redskins last victory came October 15, 2015 in a 22-5 win over Wichita East. The victory takes Wichita North from the longest losing streak in Class 6A to now tied for the longest win streak – 1 game. On Thursday night, Class 4A’s top-ranked Bishop Miege Stags outlasted defending 6A champion Blue Valley North, 33-21. New MIege quarterback Sam Pedrotti passed for 129 yards including touchdowns to Daniel Jackson and Phillippe Wesley. The Stags relied on their run game and specifically junior back Brison Cobbins. Cobbins rushed 23 times for 202 yards and three scores in the game. The Miege defense forced four Blue Valley North turnovers. North quarterback Graham Mertz finished 27 of 48 passing and two touchdowns, but was intercepted three times.